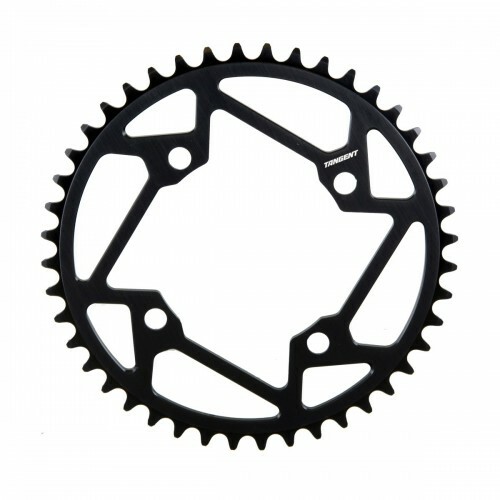 Aluminum 6061-T6 CNC machined chainring.Fixing 4 screws diameter 104 mm.Thickness 4.4mm.For chain 3/32".Weight: 122 g (44T).From 38 to 50 teeth. Aluminum 6061-T6 CNC machined chainring.Fixing 4 screws diameter 104 mm.Thickness 4.4mm.For chain 3/32".Weight: 122 g (44T).From 38 to 47 & 50 teeth. 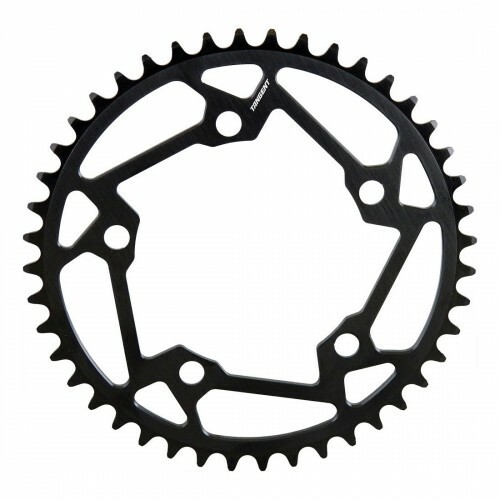 Aluminum 6061-T6 BMX Racing chainring.Fixing 4 screws diameter 104 mm.For chain 3/32 ''.From 34 to 44 teeth. 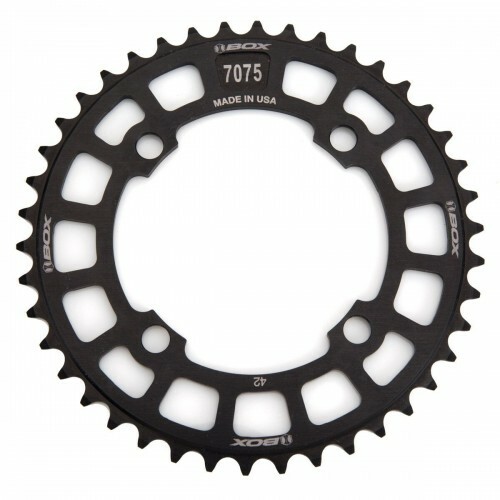 Made in the US from 6061-T6 aluminum alloy, Box Two™ Chainrings are round and true. They fit 104 BCD four-bolt cranks and are available in black anodized with laser-etched graphics from 38 to 45-teeth. 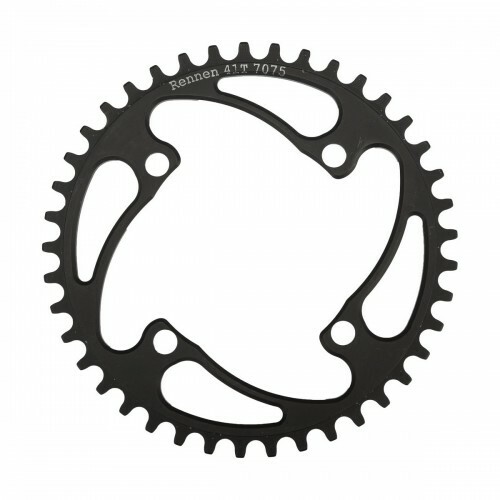 Made in the US from 7075 aluminum alloy, Box One™ Chainrings are round and true. They fit 104-BCD four-bolt cranks. The 7075 rings come in sizes of 41 to 44-teeth only and have a durable hard anodized finish. 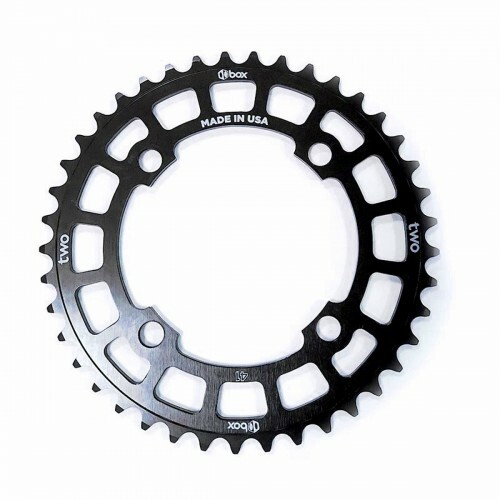 Aluminum BMX Racing chainring.Fixing 5 screws diameter 110 mm.For chain 3/32" and 1/8".Weight: 80 g (44T).From 34 to 44 teeth.